As part of The Wharf Mooloolaba’s $10million refurbishment, some exciting new retail ventures will open their doors this week, joining a mix of cafes, restaurants, bars and recreational attractions already busy operating in the open-air precinct. The launch of these new retail businesses is further evidence The Wharf Mooloolaba is firmly re-establishing a reputation as the place to meet, eat and explore at Mooloolaba and on the Sunshine Coast. Wharf management and leasing agent, Transact Property Group director Janine Gee said she was delighted to welcome the new businesses, Bedouin Traders – a homewares and fashion boutique selling wares from around the globe, and Mikimi Resortwear – a coastal inspired boutique featuring ethical, independent and Australian fashion and homewares, which join Meraki Thread Co – a fashion boutique specialising in vintage and up-cycled clothing which opened in June. “With the opening of Bedouin Traders and Mikimi this week joining Meraki Thread Co and more retail offerings coming up, it’s very exciting times at The Wharf Mooloolaba,” Mrs Gee said. Brad Johnson from Bedouin Traders, Janine Gee from Trasnact Property Group, Miki Grubic from Mikimi Resortwear & Jess Bos from Meraki Thread Co at the launch of the new fashion retailers. Bedouin Traders owner, Brad Johnson, who started his business with a shop at Peregian Beach last year, said the retail space available at The Wharf Mooloolaba makes it the ideal location to expand his thriving business. “We have a carefully curated collection of interiors, homewares, art and fashion sourced from around the globe already popular among locals and visitors alike. “I moved up from Melbourne in 2010 and this part of the Sunshine Coast just has this energy,” Mr Johnson said. “There’s something quite special about The Wharf and the space here, I love what they’ve already achieved with the refurbishment. 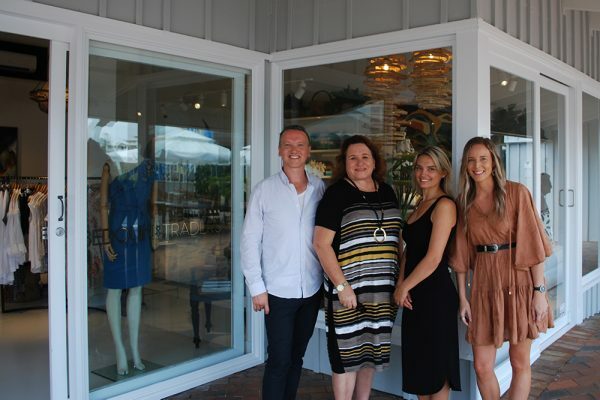 Coastal fashion and homewares specialists Mikimi Resortwear will stock a range of womenswear made from eco-friendly fabrics like linen, bamboo and vegan leather, handmade jewellery, homewares and gifts, with owner Miki Grubic saying she will only stock brands with a commitment to responsible manufacturing. “I firmly believe that every time you spend money you cast a vote for the kind of world you want,” said Mrs Grubic. “At Mikimi Resortwear, we focus heavily on ethical production and sustainable practices with all of our designers and as well as supporting local designers we want to give new designers a chance to break in to the industry rather than sourcing stock from overseas. The two new boutiques at The Wharf Mooloolaba join the flagship store of eco-conscious lifestyle brand Meraki Thread Co., which specialises in vintage and up-cycled clothing, recycled fabrics and items from small ethical Australian labels as well as some locally hand-made pieces and beautiful Australian swimwear. Meraki Thread Co co-owner Jess Bos said she aims to stock unique, one-off pieces sourced here and abroad. Mrs Gee said since the completion of stage one of the refurbishment in December last year, which saw the opening of Saltwater Fish and Chippery, Bistro, Rice Boi, and its cocktail bar upstairs and The Dock Mooloolaba, visitation to the precinct has significantly increased to approximately 500,000 per year. “With renovation works nearing completion of stage two later this year, the addition of these great businesses and more to come by year’s end, we expect visitation will only continue to grow. While space is becoming limited, there are still some great leasing opportunities for a mix of boutiques, casual dining and services such as barbers and other offerings being sought. Contact Transact Property Group for details – call on +61 7 5353 6044 or email info@transactpg.com.au.